Saracens survived a late Northampton fightback to tighten their grip on the Premiership top spot with a narrow victory over the second-placed side. David Strettle crossed in the corner for Saracens, who then conceded a penalty try from Samu Manoa's drive. The hosts pulled away with Kelly Brown finishing and Marcelo Bosch chipping in with two penalties and a try. With Matt Stevens sin-binned, Luther Burrell and George North scored for Saints for a losing bonus point. Saracens had lost their last four meetings in all competitions against Saints, but dominated for most of this victory - a sixth on the bounce in this competition - and the 10-point lead they have opened up at the top of the table will have strengthened the belief around Allianz Park that a second Premiership title is in the offing this season. Northampton were always chasing the hosts and had rarely troubled Mark McCall's men until a dramatic burst in the final 10 minutes brought them to within a try of taking the win. This was a third consecutive Premiership defeat for Jim Mallinder's men and, despite a late rally, they are at risk of surrendering second place and an all important home play-off semi-final to Leicester, who are three points behind their East Midlands rivals after beating London Wasps this weekend. The hosts, led by Steve Borthwick in his record 263rd Premiership appearance, had the early upper hand as Brad Barritt made in-roads through the middle of the Saints defence and Owen Farrell popped a perfectly-weighted kick into the corner that Strettle did well to finish before running out of pitch. Farrell missed from the tee before his opposite number Stephen Myler put over a penalty after a Sarries infringement at the scrum. 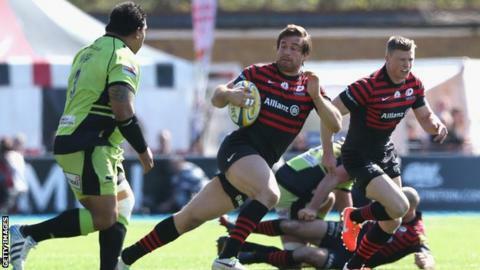 And Saracens' ill-discipline would see them hand brief momentum to the visitors, pulling down one maul and then conceding a converted penalty try when Neil de Kock came in from the side as Manoa forced a catch and drive to the line. While Saints were getting joy at the set-piece, the league leaders were looking sharper in open play, and would grasp the initiative once again as Schalk Brits made progress up the pitch to start a move that finished with Brown stepping inside and crossing over. Farrell, who had to stomach a pair of massive hits from Calum Clark and Courtney Lawes, would pick up the extras, but handed a 58-metre penalty to team-mate Bosch, who made light of the huge distance to split the posts and followed up with another successful effort from closer in. Saints continued to struggle with Saracens' creativity and pace, and a penalty conceded at the breakdown moments before half-time was put over by Farrell, but the England fly-half looked to be struggling with a foot injury and was replaced by Charlie Hodgson at the break. Northampton's sloppiness continued in the second period, as George Pisi failed to take in a low pass and Saracens were ruthless from the interception as Chris Ashton went close to crossing before Bosch finally finished and Hodgson converted. The Saints response came, but it took too long to gather steam, with Sarries seemingly comfortable in defence until Stevens was shown a yellow card for conceding one penalty too many in the final 10 minutes. That enabled Burrell to find the space to burst through and touch down with his fingertips, before North crossed in the opposite corner and was awarded the try after a television review. Myler converted both to set up a grandstand finish, but with the 80 minutes up, Saints conceded a penalty to hand the win to Saracens, who now need two more points to guarantee a home play-off semi. "I wouldn't want the last 10 minutes to take away from the first 70. I was chuffed with how we played. "I think that's up there with as good as we have played all season. What I enjoyed was the intent we had in everything we did - counter attack, carrying the ball, defence. I thought we were really good. "I didn't agree with Bosch's decision to kick [the 58-metre penalty]. I thought it was too far. It was important. "To play like that at Allianz Park is where we want to be in a play-off semi-final. We need two more points to get there and we're as close as we can be. We'll ignore the last 10 minutes. "It's too early to say on Farrell's injury. It's a foot injury and it's hard to tell on foot injuries." "They dominated the game for 70 minutes. We didn't get much field position in the first half. "We scored a good try from the maul but really didn't have any opportunities and in the second half went wide too soon which fell into the hands of Sarries' rush defence. "We're disappointed the accuracy of our game wasn't there. But the pleasing thing is we showed character to come back." Saracens: Wyles; Ashton, Bosch, Barritt, Strettle; Farrell, de Kock; M Vunipola, Brits, Johnston; Borthwick, Botha; Wray, Brown, B Vunipola. Replacements: Streather for Bosch (71), Hodgson for Strettle (13), Wigglesworth for de Kock (51), Barrington for M Vunipola (58), George for Brits (51), Stevens for Johnston (51), Sheriff for Borthwick (57), Burger for Wray (71). Northampton: Foden; Elliott, G Pisi, Burrell, North; Myler, L. Dickson; A Waller, McMillian, Ma'afu; Lawes, C Day; Clark, Wood, Manoa. Replacements: Wilson for G Pisi (69),Fotuali'i for L. Dickson (54), E Waller for A Waller (58), Haywood for McMillian (54), Denman for Ma'afu (58), Dickinson for C Day (71), Dowson for Clark (61).